The facility includes radiology, gynecology, and surgical departments, a day-hospital, examination rooms, consultation and procedure rooms, a pharmacy, laboratory, and patient counseling areas as well as group, semi-private, and private treatment areas and administrative space. The clearly organized plan, natural materials and colors provide a supportive environment for patients, visitors and staff. Patients enter through a light-filled elevator lobby, finished with glass wall panels, stone flooring and a vaulted wood ceiling, and are received in an open waiting area with oriented views to the outdoors. Warm beech wood used for the vault continues in the reception desk, paneled walls, accessible slat ceiling, banquette seating trim and throughout the facility. All are complemented by a soft green limestone floor. An arc shape in the ceiling, mirrored in the floor pattern and desk design, directs toward smaller waiting areas to the north and south, where the same material palette and banquette seating reoccur. These sub-waiting areas are centrally located between groups of exam rooms and consultation rooms, arranged for convenient way-finding. Translucent glass in doors and sidelights transmit light and minimize the apparent length of interior hallways. 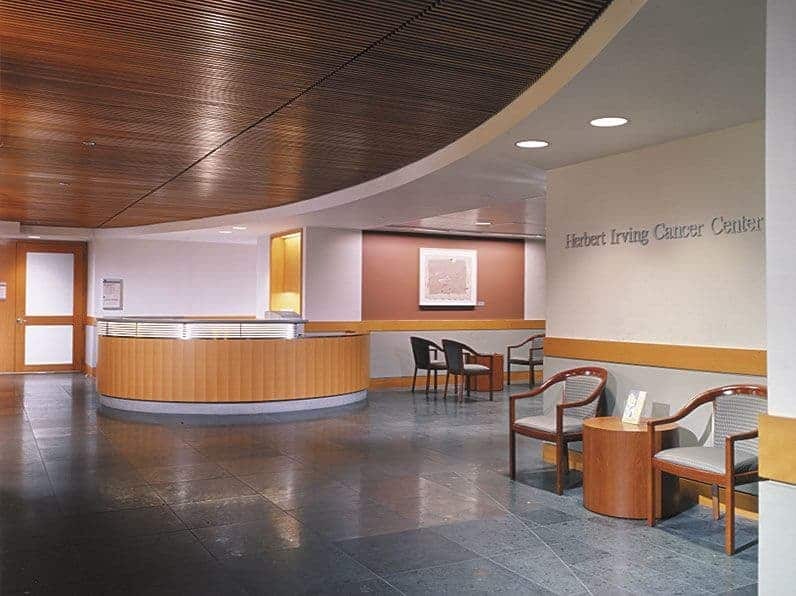 The open group and semi-private chemotherapy areas take advantage of views, including one of the Hudson River, and are organized to minimize visual clutter and maximize staff efficiency. Supply, waste and staff prep areas are nearby but out of patients’ sight. Curved ceiling tracks define patient areas, each lighted by a translucent glass fixture mounted in a domed recess, creating a comfortable, diffuse light. Task lighting is provided by the adjustable lamp attached to mobile storage taboret next to each patient. The pharmacy and laboratory are centrally located to serve the entire five-floor center via dumbwaiter access.